What if HDP voters believe the elections were not fair? Many people have been asking me lately if I think the HDP will cross the 10% election threshold, looking at me with an expectation as if I had some crystal ball. Like everybody else, I haven’t a clue. I also don’t know what will happen if they don’t make the threshold and won’t be in parliament. Journalists may be able to explain what is happening currently, but are definitely not clairvoyants. All predictions about the HP and the threshold are speculations. But one such speculation in particular scares me, and that is the possibility that HDP might end up with just under 10% and HDP voters don’t believe the elections were fair. We have seen last year on a small scale in Agri what such suspicions can lead to, where the AKP won the local elections and soon accusations of fraud leaked out. Tension in the city until the re-elections were held, violence, people wounded. I was there last year in Agri when the elections were re-run. The BDP won, and I remember being struck by the explosion of emotions I saw on the streets. BDP voters were dancing halays like I have never seen halays danced before. They were stamping their feet on the ground as if the earth would break, and I saw such ultra happy faces. Even some AKP voters whom I talked to admitted they were not unhappy their party lost, because it saved Agri some violence. I believe they were right. If those emotions had erupted in a negative way… I don’t even want to think about that. How to make sure that people will at least believe the election result if HDP scores let’s say 9.8 or 9.9%? Maybe that’s not fully possible, since some HDP voters have already told me the cheating has already begun, with the AKP ‘buying’ votes with money and other advantages for those who vote for them. I don’t know if this is true and such stories are always hard to check. But I do know that if people are convinced that these things are happening, in other words if people already do not trust the outcome of the vote before it even took place, there is a serious flaw in the system and the state of democracy. But on the day of the election itself? I thought of this too in relation to Agri. I went to a school where votes were being counted, and I loved watching the process. Every single vote was held up in the air to make sure every observer could see to which party the vote was cast, and the votes which were disputed were put on a pile and later checked again more thoroughly. BDP observers were by far in the majority, but the AKP observers were assertive and strict, and everything went reasonably well and in relative harmony. 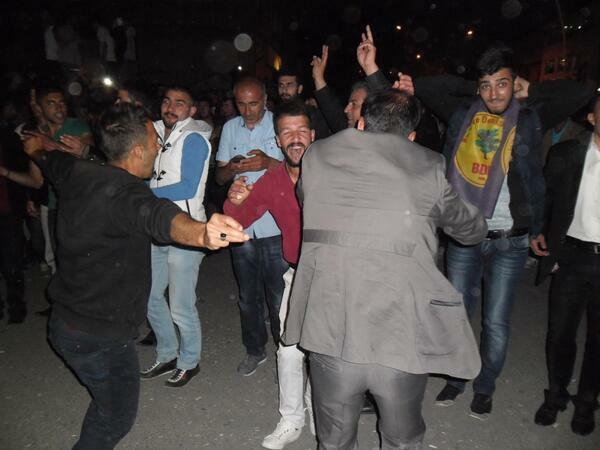 When the result was announced, the AKP voters also believed it all went fairly. 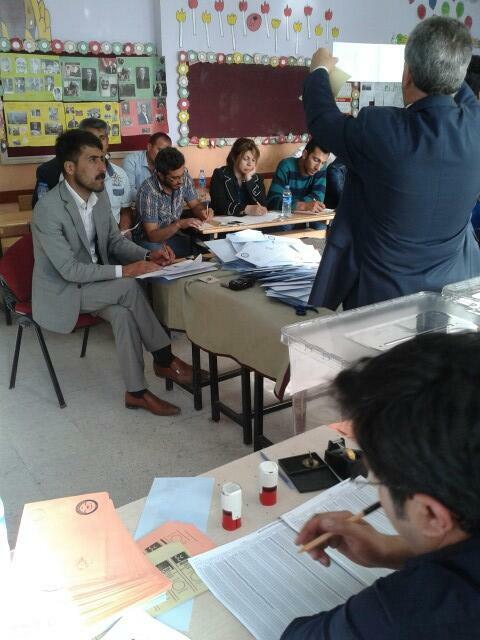 Can the HDP mobilize enough people to staff as many polling stations as possible, to check during the day and afterwards during the count that all goes fairly and that none of their votes gets lost? They made a huge effort in Agri and succeeded in having people in every single school were votes were cast, but one small city is of course quite something else than the whole country. I talked about this to a friend in Diyarbakir, who recalled his days as an observer in the 1991 elections. It was in a district somewhere in West Turkey, and he was an oberver for the HEP, one of the predecessors of the HDP, whose candidates were on the list of the SHP to get around the election threshold. They were with a small group and totally outnumbered by observers of the bigger parties at the time, DYP and Anavatan Partisi. The school where they worked that day was huge, there were many polling stations in the class rooms. He laughed hard while sharing his memories and it is hilarious when you picture these men and women running up and own stairs and in and out of class rooms to make sure they did their task as well as possible, but still, it’s sad of course. My friend added that they were under no illusion that there were ‘mistakes’ made that day in the school where they were running around. Is the HDP preparing observer teams already, making sure that in every corner of the country the elections are as fair as possible? Do they have enough people registered in cities where they are traditionally not very strong? If not – which will probably be the case – how can we be sure, in less than three months time, which percentage of the votes the HDP really managed to get? As far as I know there is a big independent monitoring group who will try to cover all polling stations. There are already rumors about APK militants willing to defraud the election process when it looks like they aren’t winning the elections. However, it is indeed uncertain up till the last counted vote.